HONG KONG (Reuters) – The Chinese yuan weakened beyond 6.95 per U.S. dollar in late trade on Thursday, dropping to its weakest since January 2017 and breaching a level that some traders had expected authorities to defend. By the end of the domestic session the spot yuan <CNY=CFXS> (0830 GMT) had steadied to close at 6.9498 per dollar, 76 pips or 0.11 percent weaker than the previous late night session close, and its weakest in 22 months. Some traders now view 7 yuan per dollar, a level last seen during the global financial crisis, as the next resistance level for the Chinese currency. Prior to the open, the PBOC set the midpoint rate <CNY=PBOC> at 6.9409 per dollar prior slightly weaker than Wednesday’s fix at 6.9357. The spot rate can trade 2 percent above or below the midpoint. Onshore trading volume <CNYSPTVOL=CFXT> stood at $31.3 billion, less than half the unusually high volume of $66.3 billion recorded on Wednesday. 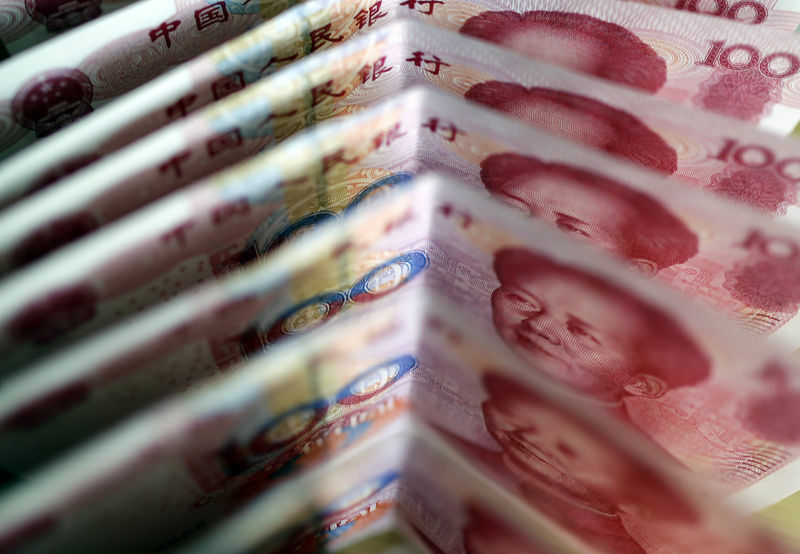 The yuan’s late slip follow the release of data from China’s FX regulator, which showed that Chinese banks sold a net $17.6 billion of foreign exchange to retail clients in September, higher than $14.9 billion in August. The Thomson Reuters/HKEX Global CNH index (RXYH), which tracks the offshore yuan against a basket of currencies on a daily basis, stood at 92.67, weaker than the previous day’s 92.73. Offshore one-year non-deliverable forwards contracts (NDFs)<CNY1YNDFOR=>, considered the best available proxy for forward-looking market expectations of the yuan’s value, traded at 7.0436, -1.46 percent away from the midpoint.